There are different courses to suit your needs. Beginners: we will build your confidence to help you communicate in everyday situations. Elementary: we will help you build on your basic knowledge and expand your language skills. Each teaching session is 50 minutes followed by a 10 minute break. Business course is tailored to your needs. e.g. preparation for an interview, presentations, meetings or writing emails and formal letters. Exam Preparation Course is tailored to your needs e.g. assessment, exam techniques, review and practice – it’s possible to book and take a test at a centre near here (at student’s own cost). Cultural course is tailored to your needs e.g. discussing literature, art or theatre plus visits to places and events of interest. The first stage of each course is language assessment and planning your course of study to get the most out of your time here. The structure and the themes of the lessons will depend on you. What you want to learn and how you like to learn. We will use all media: newspapers, books, articles, internet, films/dvds, course books and real resource material from you. Everyday conversations over the breakfast/lunch/dinner table, meeting English speakers in ordinary situations – total immersion in English everyday life. 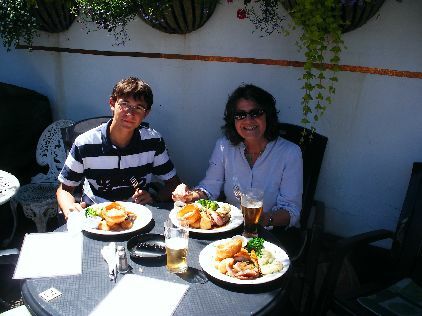 Pub Sunday Lunch in Greenwich with Gian Paulo from Italy – Roast Beef with Yorkshire Pudding! Fish & Chips in Ramsgate!